A large pothole is gapping on the brand new Danube Bridge 2 in the traffic lane from Romania to Bulgaria. The information was reported by the Bulgarian 24 Chassa daily (24 Hours). The bridge was paved in April and launched in mid-June 2013. The hole is temporarily fixed by being filled with cement instead of asphalt. The problem is larger than the hole, according to the report, because after the downpours from last week, water has leaked in the concrete corridor underneath where there are communication cables. Employees of the Road Infrastructure Agency have examined the damages on Friday. Another extensive check of the facility is expected and it will include experts from the Central Institute for Road Technologies, National and European Norms and Standards. They must assess the condition of the bridge and find out what caused the damage just months after it was hydro-isolated and paved. In April 2013, before the second bridge was launched, a large pothole on Danube Bridge 1 clogged traffic between Bulgaria and Romania. Danube Bridge 2, linking Vidin in Bulgaria and Calafat in Romania, is part of the Pan-European transport corridor IV. The total value of the project is EUR 282 M. Of them EUR 106 M came from EU funds and the rest were national financing and private investments. The project was started in the late 1990s, but was stalled multiple times. The only other existing bridge between the two Balkan neighbors, Danube Bridge 1 linking Ruse-Giurgiu, was completed in 1954. 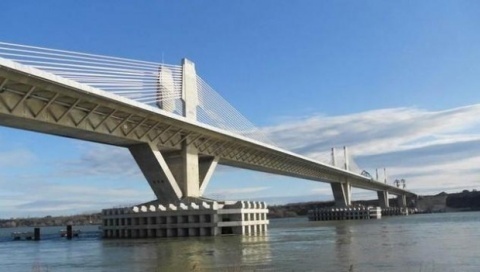 In February 2013, officials stated that Danube Bridge II would be inaugurated on May 9, the Day of Europe, but the ceremony was postponed. The final section of the bridge was finished in October 2012 and the entire construction between the Bulgarian and the Romanian Danube shores was connected. It was announced earlier that the infrastructure has been completed as of the end of August 2012. Over 415 000 vehicles are expected to pass through the bridge in its first year of operation – 186 000 cars, 20 000 buses, 209 000 trucks as well as 4 745 trains – 730 passenger and 4 015 freight ones. Their number is expected to reach 8 504 by 2030. The facility will pay off in 12 to 15 years, according to Bulgarian authorities. The bridge is 1.8 km long and has four lanes, a railroad, a sidewalk, and a bike path. There is a cross border checkpoint as well. The toll is the same as the one in Ruse – from EUR 6 to EUR 37, depending on the type of vehicle. There are no fees for pedestrians, bikers, fire trucks, ambulances and police cruisers.